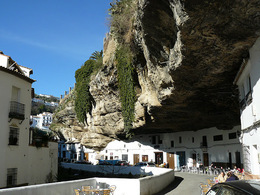 ​One of the best restaurants in Ronda, is situated right on our doorstep. Just a 2 minute walk from La Perla Blanca sits a riverside restaurant and bar with a delicious menu, with international flair, that changes daily. La Cascada boasts outdoor dining terraces in the summer, and cosy fireside dining in the winter. De Locas Tapas, a modern style international and Spanish tapas bar situated in the old town, always highly rated by many and a must visit when in Ronda. El Muelle de Arriate, situated 10 minutes drive away in a converted train bunker and rated as one of the best restaurants in Andalucia. Frank, the proprietor, will explain the menu in detail and will ensure you leave content and happy. Casa Maria an experience you will never forget, Tragata run by michelin star chef Bonito Gomez, Taberna el Almacen with imaginative tapas, and finally flamenco restaurant El QuinQue all offer an excellent experience. There are lots more restaurants to choose from in Ronda as well. For a cultural Ronda tour, Alex from Entrelenguas will show you the main sites of Ronda as well as the hidden secrets which only a local will know. 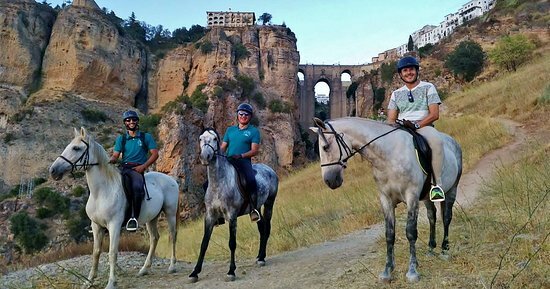 ​For the active among you the countryside around Ronda offers some spectacular horse riding and Sandra at caballos y vino (horses and wine) will ensure you have an unforgettable day. To see a real working farm then visit Reservatauro Ronda, where you will learn about about breeding of fighting bulls and pure Spanish horses. Treat yourself and your loved one to a romantic BBQ dinner around the pool. Your table will be set, the BBQ will be glowing and your food will be freshly delivered for you to cook to your liking. Watch the sun go down over a glass of wine before sitting to enjoy your own private meal. Only 1 available per day so please book early. Get the photo that everyone wants! A 90 minute 4x4 tour taking you along the track below the cliffs of Ronda with stunning scenery the whole way. Taking in the famous Puente Nuevo with a glass of cava and after returning to Perla Blanca. Setenil, Olvera, Benaojan and Motejaque and the Cueva del Gato (A stunning natural swimming oasis). With lots of places to stop for lunch or a drink you will step back into Real Spain. Maps are available on arrival at our hotel. Closed every Monday for maintenance work. ​Tickets are essential and must be booked in advance. We completely recommend basing yourself at our property, for between 4 days - 2 weeks, allowing you to unpack and unwind, and make the most of Andalucia with day visits, returning back to La Perla Blanca each evening to relax in comfort.